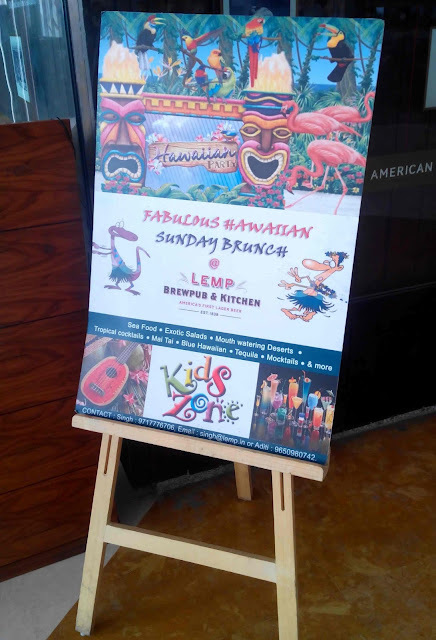 A few of us friends (young, 25-year old, working, well educated, aware, well traveled, well spoken) were searching for a place to go to for Sunday brunch and on Zomato.com we came across a "Hawaiian Sunday Brunch" at Lemp Brewpub, Gurgaon. 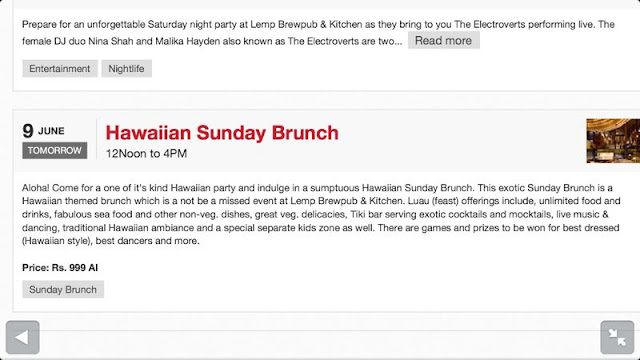 We decided to try out the Hawaiian brunch. As you can see from the image below, the cost is Rs. 999 all inclusive of taxes, and the same was also confirmed to us by the manager, Mr. Robin. To put it out there, it wasn't the first time we were going to Lemp. Hawaiian food - NONE to be found. Tiki bar serving exotic cocktails - there was no such bar. Live music and dancing - There was no music playing at all. After we asked they switched on the speakers and regular music played in the background. For the dancing, there were never any plans for dancers. On a serious note we were told by the manager, Robin, that customers were the ones supposed to dance. After waiting 10 minutes, we are served starters on the table which are absolutely stale, inedible, cold and uncooked. We immediately called back Robin and request him to taste the food so he can understand our plight. Even though a buffet includes unlimited ordering, Robin tells us he'll do us a favour and 'replace' the dishes. By then we try the other dishes served on our table and they are equally ill-prepared. The replaced dishes come back absolutely the same quality, just heated this time around. The drinks included in the package were their 6 home-brewed beers and any vodka-based cocktails. 6 of us ordered a glass of beer each and we asked for 2 vodka-based Mojitos. The beers came in good time but the 2 Mojito's never came. There were 4 reminders given to various staff including the manager, Robin. Robin told us that the confusion resulted because the staff who took our order suddenly left for a break without informing anyone. To our surprise each of the staff members we had told for the Mojitos were very much inside the place and had been continuously serving our table! Mr. Robin - The Manager who 'chose' 3 different prices for the Sunday brunch during this incident. This photo was clicked secretly from one of our phones. Not wanting to waste anymore time, we walk out towards the elevator and 4 of us get in (3 guys and a girl). Suddenly there are bouncers blocking the tiny entrance of the elevator and intimidating and threatening us against leaving. The waiters and the other staff of Lemp had all surrounded us by then. We do what came to our mind 1st in a panic, raise noise so we can get out of the elevator into an open area. Having lived in Gurgaon for the last 10 years, that was the most scared we've felt ever. It was absolutely not safe inside (whether the girl had been with us or not). 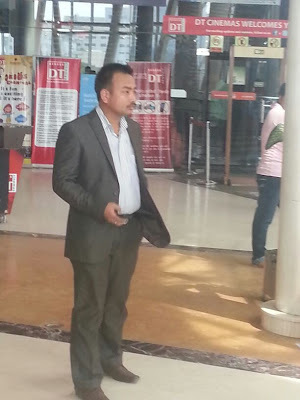 Mr. Kapil Singh Thapa - The Senior Manager who is mentioned on many many reviews on the internet for his misbehaviour towards customers. This photo was also clicked secretly from one of our phones. Guess what happens next? The police arrives. With the 'owner' of the place. Very clearly they came together. We are in an even more helpless situation. This 'owner', Shashank, was even more arrogant than the previous two managers, rather tending towards the likes of a goon. 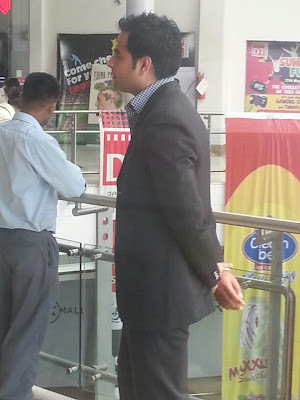 He even said, "Mera naam kisi se bhi Gurgaon mein check kar lena." ("You can ask anyone my name in Gurgaon and they will know.") He further declares (in Hindi) he will not hear a word against his food or his place or he will get us put behind bars. He goes on to declare that his managers have been running this place for more than a year and they are absolutely right. 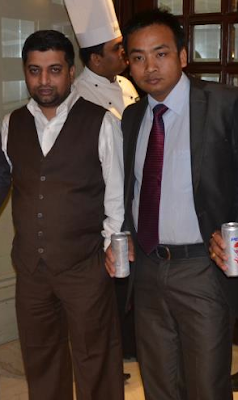 The 'owner' Shashank (L) and the senior manager, Kapil Thapa (R), from a public photo found on Facebook. 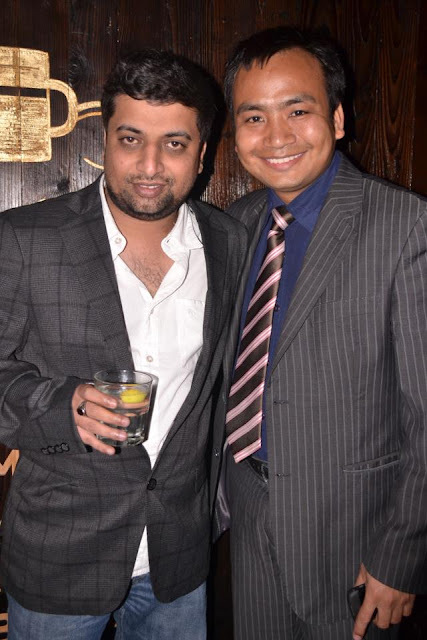 The 'owner' Shashank (L) and the senior manager, Kapil Thapa (R), from another public photo found on Facebook. When asked to explain how the bill of Rs. 12,000 could be presented, the same managers, Robin and Kapil, state that the buffet costs Rs. 1,199 per head + taxes. We showed everyone the screenshot of the Zomato page. Unfortunately, the police could not understand what the internet was and the Lemp management disowned the page. Instead an order is sent inside to instantly get rid of any paper/board where the price of the buffet maybe written. Suddenly realising that even then the calculation doesn't add up for 8 buffets @ Rs. 1199, a friend raises the point. Now the buffet in an instant costs Rs. 1,299! When we told the policemen that this is exactly the kind of experience we have had, the police tell us they didn't hear the manager changing the price of the buffet. Unbelievable. Most of all - HELPLESSNESS. Note - all this being said in Hindi/Haryanvi doesn't sound half as pleasant as it may read in English. The owner was now 'too busy' to come to the police station (which was barely 200-300m away from Lemp) but already had control over the cops. The SHO was called to the station and in the end we still paid the Rs. 4,463 to the manager there. We were told there was no need of any letter stating the issue was resolved with a compromise from our side. Finally, thats when this horrid 'brunch' ended. On a separate note, I wanted to cover a small incident that the girl with us faced. She was wearing shorts and a t-shirt. The Lemp waiters/staff were leching on her and kept staring at her legs. When one of us told one of their staff members "Aap apni aankhein please oopar rakhiye" ("Please keep your eyes up") he replies, "Kya karoon neeche hi chali jaati hain." (What can I do, my sight goes downwards automatically." This happened while the cops were there. This happened while we were surrounded by the Lemp staff and their bouncer + mall management bouncers. This is why the only thing on our minds throughout was to get out of the situation safely at that point. "The manager was so indecent that we immediately left... teared all vouchers just in front of him... This place is only for those who want to spoil their evening by fighting with rude managers." 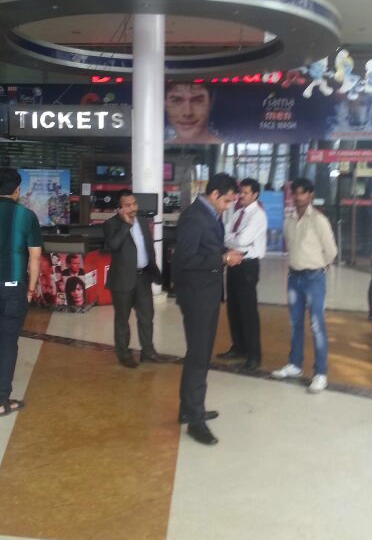 "Never seen more ruder bouncers.managers while entering place. So cocky for no reason." "A bunch of moronic unapologetic staff members!" "The staff don't have manners to interact with customers." "Mr. Thapa was so bossy and busy"
"underhand in their approach to adding things onto the bill that had not been actually consumed." "staff did not agree to the mistake that they had misleaded the public, rather they asked to leave if we did not want to stand!!!" 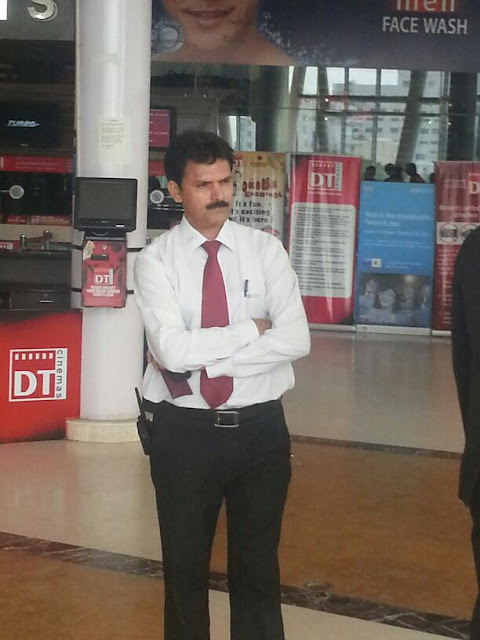 "The Asst Manager - Thapa - was just unwilling to listen to anything."